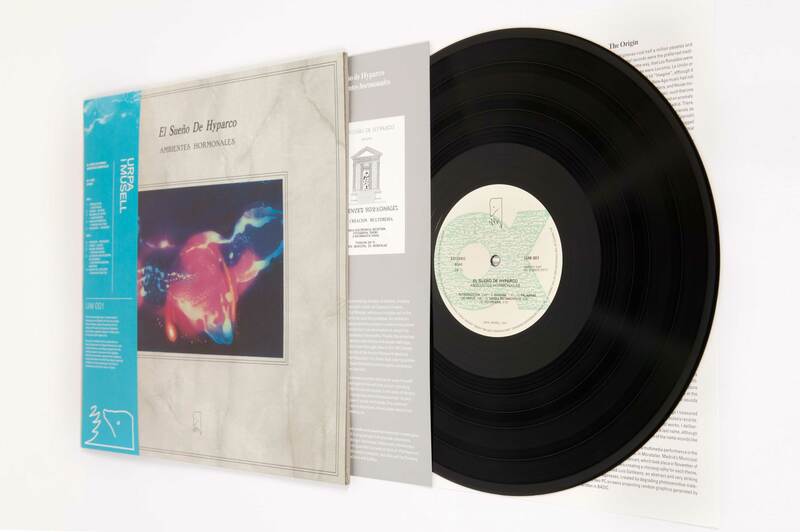 The new record label Urpa i musell, based in Barcelona and affiliated with the record store Discos Paradiso, begins its journey with the reissue of El sueño de Hyparco’s Ambientes hormonales, originally released in 1990 under the Spanish label Hyades Arts. 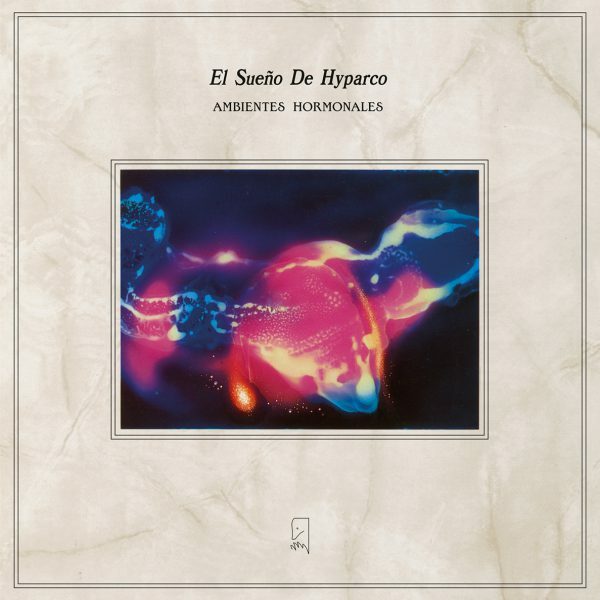 El sueño de Hyparco (Hyparco’s Dream) was a mutant electronic music project led by the multidisciplinary artist Antonio Dyaz (aka Klaus Böhlmann). It was active mainly between the mid-eighties and mid-nineties. What began as a humble bedroom project in the working-class Madrid suburb of Moratalaz evolved into a melting pot of close interdisciplinary talents exchanging ideas. 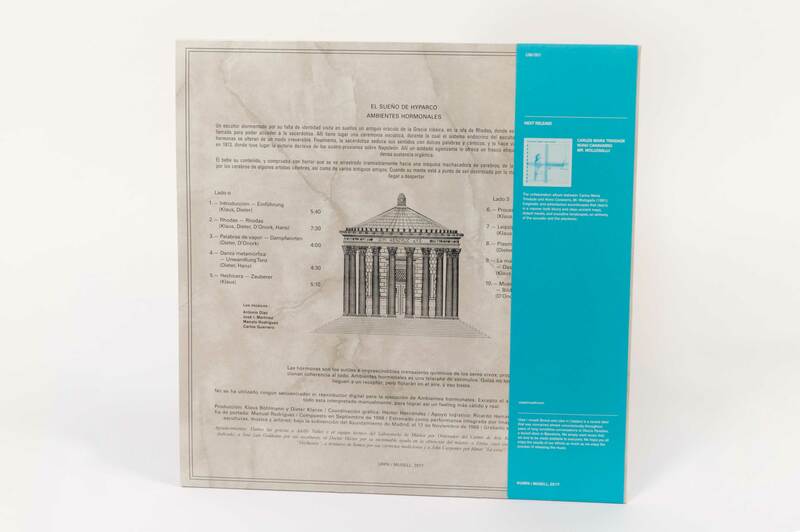 Their second record Ambientes hormonales (Hormonal Ambiances), the only release in vinyl format, is their primary one, according to Antonio. The record paints a vivid picture of this mixed media project. 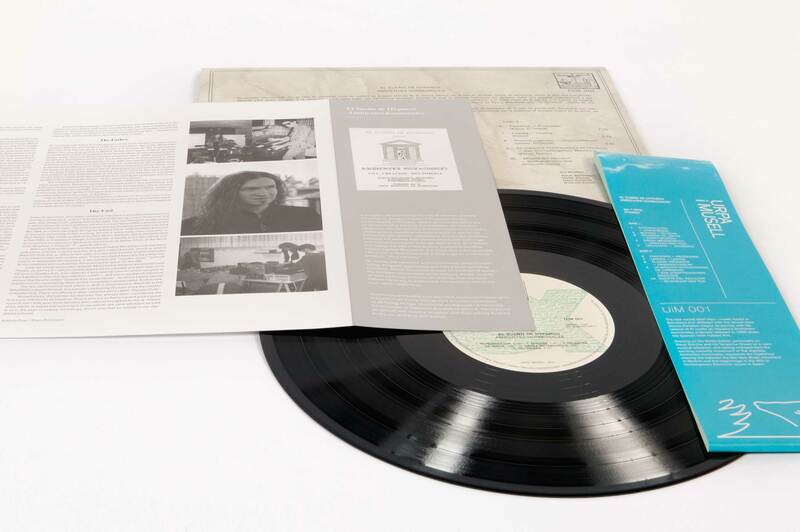 Ambientes hormonales was not conceived as an album, but as a multimedia performance, which premiered in November 1988. Based on a surrealistic plot by Antonio, a tormented sculptor moves through different eras, from classical Greece to the Battle of Leipzig 1813, on an unsuccessful quest for his identity. The performance included sculptures, actors, live music played with electronic instruments, and scenes depicted with a computer and slide projections. 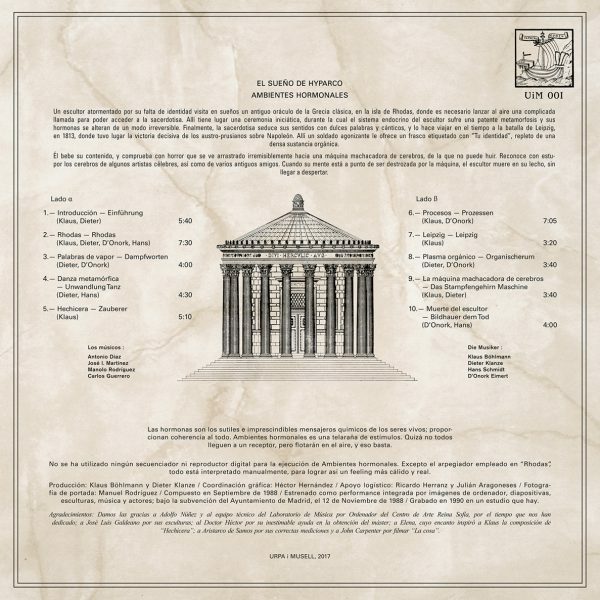 In addition to leading El sueño de Hyparco, Antonio also founded the record label Hyades Arts, which originally released this record. The label was preceded by a cassette label, Producciones Hyparco. 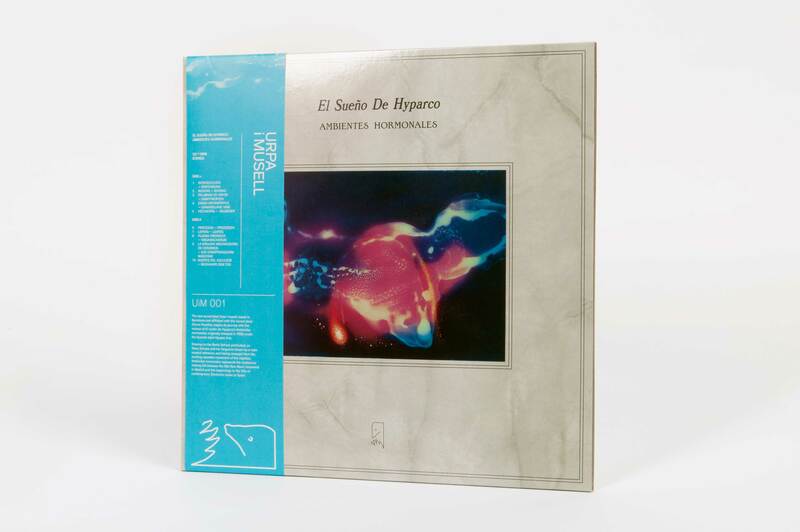 Hyades Arts is iconic as a main label responsible for keeping the flame of New Music in Spain alive during the first half of the nineties by releasing records by artists such as Iury Lech, Francisco López, Luis Paniagua, and Suso Sáiz. The project emerged as an important one in the history of forward-thinking music in Spain. 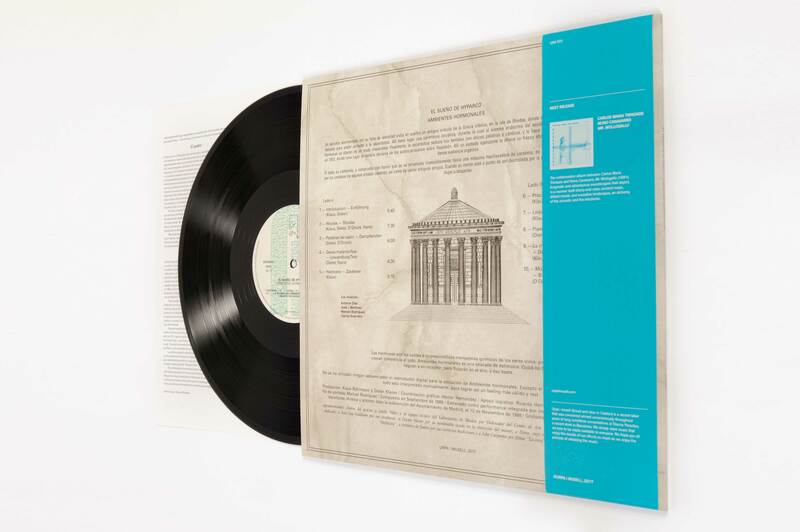 Consequently, El sueño de Hyparco performed at the 1994 debut of the nowadays internationally known Sónar, Barcelona’s Advanced Music and Multimedia Art Festival. 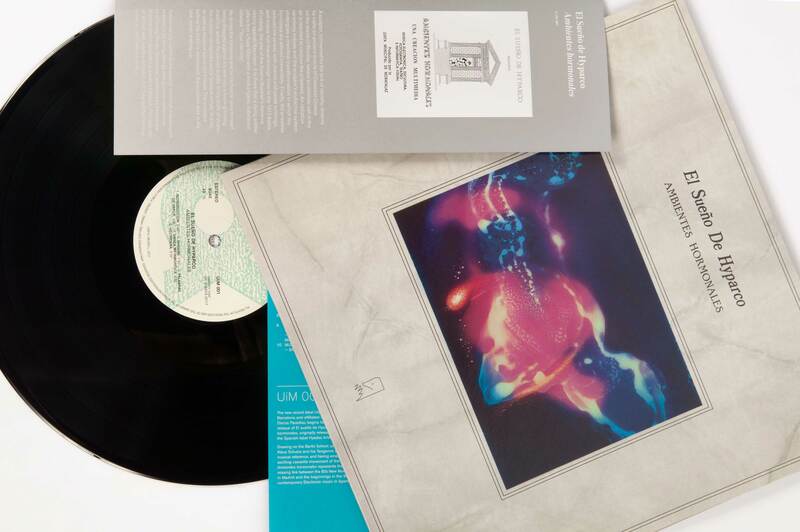 After 27 years, Ambientes hormonales is back in record stores. Drawing on the Berlin School, particularly Klaus Schulze and his Tangerine Dream, as a main musical reference, and having emerged from the exciting cassette movement of the eighties, Ambientes hormonales represents the mysterious missing link between the eighties New Music movement in Madrid and the beginnings of contemporary Electronic music in Spain in the nineties. 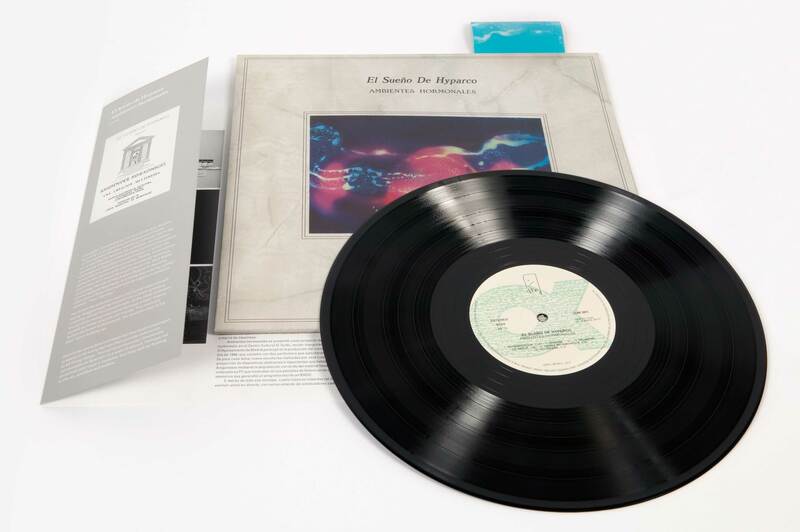 The reissue includes the remastered album, with the original artwork and a new insert, in which Antonio Dyaz aka Klaus Böhlmann recounts the journey of El sueño de Hyparco. © Urpa i musell - Urpa i musell.